The association American Friends of the Medem Library, founded during the 1990s through the impetus of Meni Wieviorka, brings together a group of American citizens who are deeply attached to the preservation of Yiddish culture and and who work to support the Maison de la culture yiddish-Bibliothèque Medem (the Medem Library and the Paris Yiddish Center of which it forms a part). 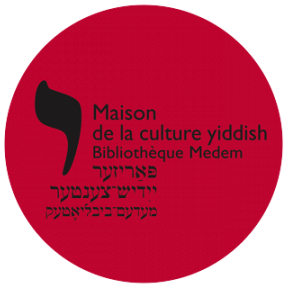 Over the years this association, with the help of several foundations and a number of private individuals interested in Yiddish culture, has been able to provide financial assistance to various projects of the Medem Library and Paris Yiddish Center. One of the most recent projects to be helped by the association is the compilation and publication of the English version of the Yiddish-French dictionary produced by Yitskhok Niborski and Bernard Vaisbrot. This English version, entitled Comprehensive Yiddish-English Dictionary, whose chief editors are Solon Beinfeld and Harry Bochner, was published in January 2013 by Indiana University Press. If you would like to make a contribution to the American friends of the Medem Library, click here. All donations to the American Friends of the Medem Library are tax deductible. The American Friends of the Medem Library, Inc. has been granted an exemption from United States Federal income tax by the Department of the Treasury, Internal Revenue Service, pursuant to Section 501 (c) (3) of the Internal Revenue Code.